The Eagles were granted permission Friday to interview Colts offensive coordinator Bruce Arians and Seahawks defensive coordinator Gus Bradley for their coaching vacancy. Former Head coach Andy Reid prepares to take on the Dallas Cowboys at Cowboys Stadium on December 2, 2012 in Arlington, Texas. 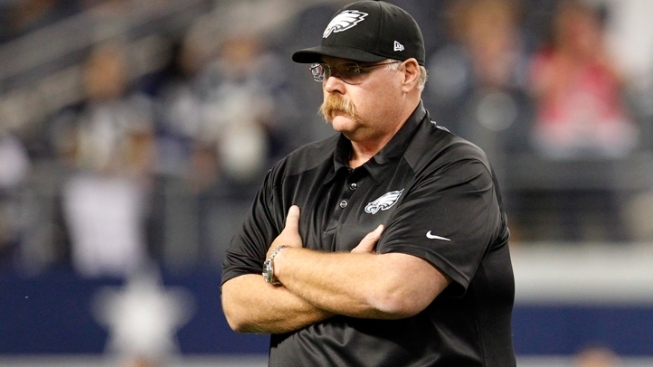 After 14 seasons, the Eagles are looking for Reid's replacement. While Andy Reid has found a new home, the Philadelphia Eagles' search to replace him could take some time. Team officials already met with three candidates and plan to interview Broncos offensive coordinator Mike McCoy in Denver on Sunday. Oregon coach Chip Kelly was on Philadelphia's list, but a person familiar with the situation told The Associated Press he's nearing a deal with Cleveland and the Eagles are "heading in another direction." That person, who spoke to The Associated Press on condition of anonymity because the team isn't discussing its negotiations publicly, said the Eagles planned to interview several other candidates regardless of any conversations with Kelly. Reid, who was fired Monday after a 4-12 season, has agreed to a five-year deal with the Kansas City Chiefs, according to two people familiar with those negotiations. Reid flew to Kansas City on Friday and already has started assembling his coaching staff, which should include some former assistants. The Eagles interviewed Penn State's Bill O'Brien on Thursday and met with Atlanta Falcons defensive coordinator Mike Nolan and special teams coordinator Keith Armstrong on Wednesday. O'Brien is remaining at Penn State. The Eagles wanted to talk to Falcons offensive coordinator Dirk Koetter, but he signed a contract extension to stay with the team through next season. The interviews with Arians and Bradley will take place next week. Arians was 9-3 as interim coach in Indianapolis filling in for Chuck Pagano. He previously served as Pittsburgh's offensive coordinator from 2007-11. The 60-year-old Arians is quite familiar with Philadelphia, having coached Temple from 1983-88. Bradley is in his fourth season in Seattle. His defense finished first in the NFL in points allowed (15.3) and fourth in yards (306.2). "There are some outstanding college coaches out there and some outstanding coordinators out there," owner Jeffrey Lurie said after firing Reid. "There are outstanding coaches that used to coach in the National Football League out there. (We'll leave) no stone unturned, and we're open to it all." The Eagles' search could last until after the Super Bowl. There are several other coaches on playoff teams that could get interviews with Philadelphia, including Cincinnati's Jay Gruden and Mike Zimmer, Green Bay's Ben McAdoo, Seattle's Darrell Bevell, Washington's Kyle Shanahan and Houston offensive coordinator Rick Dennison. Former coaches Jon Gruden, Bill Cowher and Tony Dungy, all Super Bowl winners, are not on Philadelphia's radar at this time. The Eagles went to the playoffs nine times in Reid's 14 seasons, but not since 2010. They last won a playoff game in 2008.